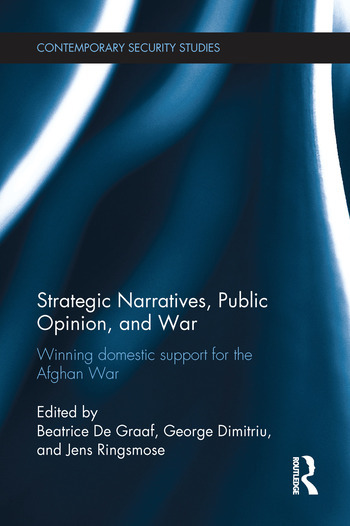 This volume explores the way governments endeavoured to build and maintain public support for the war in Afghanistan, combining new insights on the effects of strategic narratives with an exhaustive series of case studies. In contemporary wars, with public opinion impacting heavily on outcomes, strategic narratives provide a grid for interpreting the why, what and how of the conflict. This book asks how public support for the deployment of military troops to Afghanistan was garnered, sustained or lost in thirteen contributing nations. Public attitudes in the US, Canada, Australia and Europe towards the use of military force were greatly shaped by the cohesiveness and content of the strategic narratives employed by national policy-makers. Assessing the ability of countries to craft a successful strategic narrative, the book addresses the following key areas: 1) how governments employ strategic narratives to gain public support; 2) how strategic narratives develop during the course of the conflict; 3) how these narratives are disseminated, framed and perceived through various media outlets; 4) how domestic audiences respond to strategic narratives; 5) how this interplay is conditioned by both events on the ground, in Afghanistan, and by structural elements of the domestic political systems. This book will be of much interest to students of international intervention, foreign policy, political communication, international security, strategic studies and IR in general. Beatrice De Graaf is professor for the History of International Relations & Global Governance at the Utrecht University, The Netherlands. George Dimitriu is a Research Fellow at the Netherlands Defence Academy. Jens Ringsmose is associate professor at the Center for War Studies, University of Southern Denmark.